a) hated man and wanted to punish him for his sins. b) loved man and desired to bless him. a) raised a great barrier in the way of God's blessing man. b) did not really cause any problem between man and God. a) God decided to overlook our sin because He loves us so much. 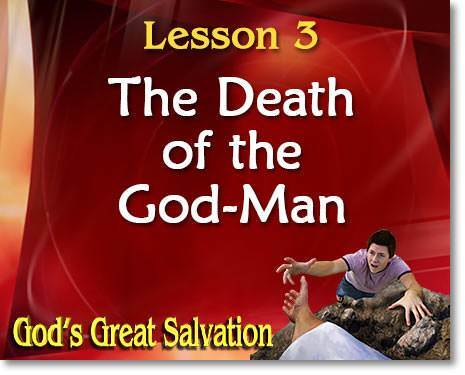 b) Christ, by His death on the cross, completely satisfied God's righteous wrath against sin. a) because God is absolutely righteous. b) because God is not loving and merciful enough. a) Christ's willingness to die as a martyr for what He believed in. b) God's love for us. a) revealing Him in all His glory as a Savior God. b) adding to God's glory by His life. a) is greater than ever because men killed God's Son. b) has been removed by Christ's sacrifice of Himself. a) what we do for God. b) what Christ has done for us. a) who does his very best to keep the Ten Commandments. b) who trusts the Lord Jesus Christ as his Savior.